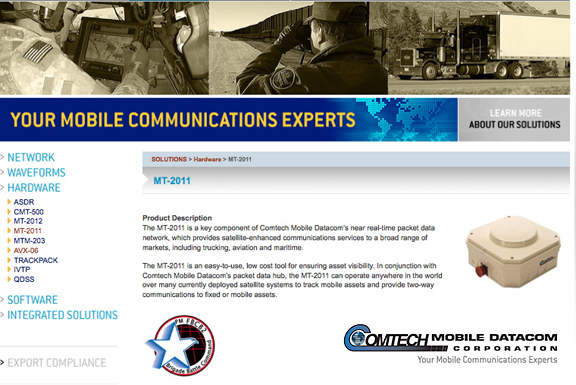 [SatNews] ComtechTelecommunications Corp.'s (Nasdaq:CMTL) subsidiary, Comtech Mobile Datacom Corporation, has received a $22.2 million order under its IDIQ contract with the U.S. Army Communications Electronics Command (CECOM) for mobile satellite data communications transceivers. Total orders received to date against this $384.0 million contract increased to $262.7 million. Comtech will supply its Model MT-2011 Mobile Satellite Ground Transceiver and its AVX-06(203) Aviation Transceiver to the Force XXI Battle Command Brigade and Below -- Blue Force Tracking (FBCB2-BFT) program, a battle command real-time situational awareness and control system.